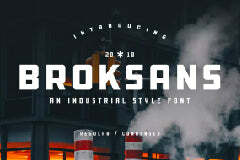 Free asfrogas font for any designer that is looking to display their design professionally. Go give some love to Font Space for creating this top-notch free typeface. You can create a professional designs with this beautiful font.